Dynasts and turncoats in Uttarakhand and Hindutva champions in Uttar Pradesh -- BJP names 64 candidates for Uttarakhand and 149 for UP. The Bharatiya Janata Party will lean on dynasts and turncoats in Uttarakhand, and on its Hindutva champions, legislators who had been booked for their alleged role in Muzaffarnagar communal riots of 2013, in Uttar Pradesh. 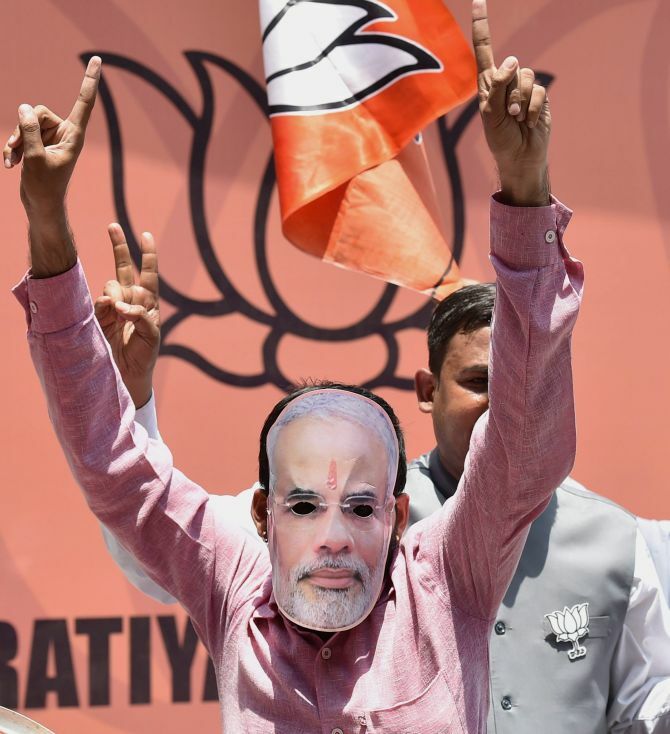 The BJP on Monday announced 64 candidates for the 70-member Uttarakhand assembly, and 149 for the seats going to the polls in Phase-I and Phase-II of the UP assembly polls. The BJP's central election committee, headed by party chief Amit Shah, had met on Sunday to decide on the list, which was released on Monday evening. On Monday morning, Yashpal Arya, former chief of the Congress' Uttarakhand unit, joined the BJP. His son Sanjeev Arya and Kedar Singh Rawat, the former Congress legislator from Yamunotri, also joined the party in Shah's presence. By evening, the BJP announced Yashpal Arya as its candidate from Bajpur, his son Sanjeev from Nainital, and Kedar Singh Rawat from Yamunotri. A six-time Congress legislator, Arya has influence among Dalits in the Kumaon region. Apart from Arya, the BJP list also accommodated nine of the 10 Congress rebels, including Harak Singh Rawat and Rekha Arya, who had joined the party last year. The only exception was former Uttarakhand chief minister Vijay Bahuguna, a sitting legislator from Sitarganj. But the list declared his younger son Saurabh as the BJP candidate from Sitarganj. BJP leader J P Nadda said the party has retained all its 31 sitting legislators in Uttarakhand. Another dynast to make her debut is former CM and Lok Sabha member B C Khanduri's daughter Ritu Khanduri Bhushan from the Yamkeshwar constituency. In Punjab, the party declared remaining six of its 23 candidates. It had announced 17 candidates last week. The remaining six seats had sitting BJP legislators. Of these, the party retained four sitting legislators, replaced the legislator from the Anandpur Sahib constituency and gave the ticket to the son of its sitting legislator from Jalandhar (west) constituency. The UP list was more intriguing as the party declared 149 of the 403 candidates. These are the seats going to polls in the first two of the seven poll phases in the state. It didn't declare candidates from seats in Lucknow, Noida, and Sahibabad. Lucknow is Home Minister Rajnath Singh's constituency. His son Pankaj is an aspirant from Sahibabad, while Congress rebel Rita Bahuguna Joshi is an aspirant from the Lucknow Cantonment seat against the Samajwadi Party's Aparna Yadav. Aparna is married to SP chief Mulayam Singh Yadav's younger son Prateek. According to sources, Rajnath Singh even walked out of Sunday's meeting, but was cajoled to return. While the party has relied on caste balance by announcing 17 candidates who have crossed over from the SP and Bahujan Samaj Party, its names for western UP have such sitting legislators as Suresh Rana and Sangeet Som. The two MLAs were accused in the Muzaffarnagar communal riots case. The BJP hopes for a strong showing in western UP, which could help it repeat its 2014 Lok Sabha success in the state. Another notable name in the UP list is that of party national secretary Shrikant Sharma, who will contest from Mathura.